I was recently approached by Jane Curtis of ABC open and she asked if I would agree to a small feature on the ABC web "Now & then" segment. 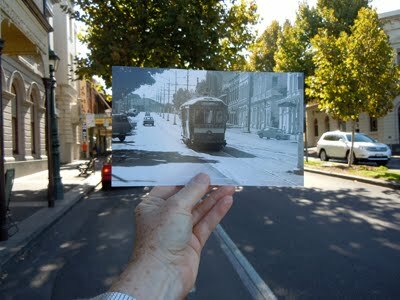 Jane and I met and re-photographed some of my original photographs from 1972 with the "Now" backgrounds of Bendigo streets. This turned out to be an interesting experience with the old and new intermixed. This picture above is one of the pieces to be re-photographed. One of the others has been published on Jane's "Now and Then" web page. Go to http://open.abc.net.au/posts/former-tram-capital-of-the-southern-hemisphere-82cv8px Another web address you can see is http://www.abc.net.au/local/stories/2012/04/16/3478533.htm Also a short video regarding my new "Faces of Bendigo" cards - go to http://open.abc.net.au/posts/finding-the-faces-95fi9wh I hope you enjoy having a look.